For untold centuries people have lived in the San Ramon Valley. They built their homes by the creeks, hunted in the valley, danced to keep the world in balance, and worshiped on the sacred mountain. 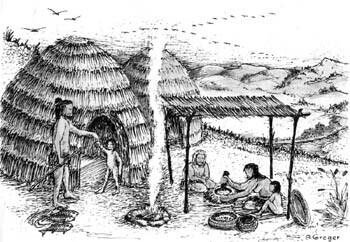 People have lived in the Bay Area for around 10,000 years and in the San Ramon Valley for at least 5,000 years. While ethnohistorians think the first people came over the Bering Strait from Asia or across the Pacific, the American Indians have their own creation accounts. One account from Bay Area Indians was recorded in 1859 and states that the Coyote and Eagle counseled together and created people. Like other accounts, this one reflects a belief that animals occupied the earth first and readied the world for human beings. We know very little specific about the Indians who lived in this valley, although they would have shared customs and practices with other Bay Area and Central Valley Indians. They would have had an intimate relationship to the land, a cycle of life which changed very little from generation to generation, and a social organization of extended family groups that owned the rights to hunt, fish, gather, camp and pray within a clearly designated territory. Living in village communities of 50 to 200 people, their lives were organized by seasonal change. Seeds and acorns were gathered and stored in the fall, meadows were burned at the same time each year, soap root was gathered in the spring, and festivals on the mountain with other tribes were scheduled for the autumn. They may have traveled to the Bay for the salmon run. The valley environment was rich with a variety of foods, including deer, rabbits, acorns, seeds, birds and fish. Ferns, bulrush and sedge were used for basket-making, and these materials were carefully stored. Trade among tribes for items unavailable in the valley was important, providing obsidian for arrowheads, dried fish and basket materials. In 1772, westerners first came through the San Ramon Valley. 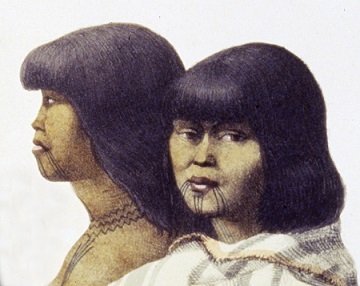 Spanish missionaries recorded the names by which the Indians were known to their neighbors: Tatcan, Seunen and Souyen. The Tatcans, part of the Bay Miwok linguistic group, were closely related to the Saclans and probably lived in the Alamo- Danville area. Their territory was the San Ramon Creek watershed, which extends from around Crow Canyon Road to Walnut Creek. The Seunens and Souyens were Costanoan (Ohlone) speakers who lived in the San Ramon-Dublin area. They lived in the Alameda Creek watershed around the South San Ramon, Alamo and Tassajara creeks. Since there was a huge marsh in the vicinity of today’s Pleasanton, they would have hunted and fished in that area. After 1794, the Indians began moving to the Spanish missions, first to San Francisco and then to San Jose. The foreign weapons, new ideas and unusual gifts intrigued them. While many chose to ally themselves with the powerful Europeans, others resisted. The Bay Miwok resistance was one reason Mission San Jose was built so close to Mission Santa Clara. Once baptized, the Indians could no longer leave the mission at will. Ultimately the Spanish ideas, diseases and grazing animals destroyed the valley Indians’ way of life. Today the tribes of the San Ramon Valley are no more, although descendants of Bay Miwok and Ohlone tribes do exist and work to keep their cultural traditions alive. Artifacts unearthed next to springs and creeks and the bedrock mortars on Mount Diablo remind us that a culture of great antiquity existed in the San Ramon Valley just 250 years ago. Sources: archives of the Museum of the San Ramon Valley and The Bancroft Library.